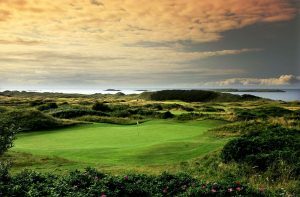 Known for its amazing scenery, Northern Ireland has several areas of natural beauty and many of the golf courses located here take full advantage of that. Whether you are a local or are on a cottage holiday, there is at least one golf course to fulfill your needs. Self-catering cottage golfing holidays are perfect for a group of like-minded golf-loving friends and a family with young children. You can get up when you like, in time for your chosen tee off time, have your meals when you like them, and spend your evenings either chilling out in the comfort of the cottage or exploring the local area. When you holiday in Northern Ireland with children, there is plenty to see no matter where you stay. Belfast has a zoo, a castle and several museums that are sure to delight children of any age. The Titanic Experience should not be missed by any visitor to the city, there is a sweet factory, and also a paint-balling arena for those who love to be active. But what about golf, after all, that is the main reason you are visiting Northern Ireland? Malone Golf Club, a little-known beauty, just a few miles south of Belfast sits pretty in 270 acres and is considered to be one of the best parkland golf courses in Northern Ireland. Over the years, it has undergone several redesigns and now has a total of 27 holes, each with its own set of challenges. Galgorm Castle watches over the 10th hole at the Galgorm Castle Golf Club. The 220-acre estate offers several reasons to visit, but the main reason has to be the stunning golf course. There are plenty of water hazards at Galgorm as it is bordered on 2 sides with rivers, and there are several small lakes dotted around the course.